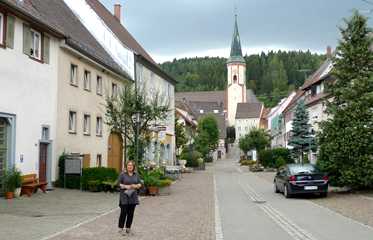 Mohringen is little town on the foothill of Schwartzwald, where Danube is still a stream. Access to this square is along pedestrianized Kreuzgasse and ends up at the very impressive Town Hall. Square itself is pleasant shortcut between the town centre and railway stop, with few resting places beneath mature trees. Möhringen was first mentioned in 882, since 1308 it has the city and market rights, but only in 1470 it received the long-desired coat of arms of Emperor Frederick III. Möhrin, cast in ore is bare-headed, wearing only a loincloth made of feathers and equipped with arrow, bow and quiver. On her head she wears a gold diadem. 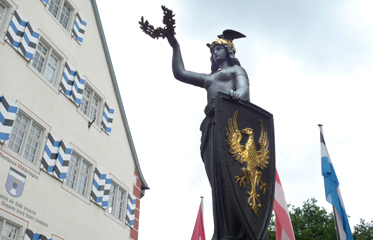 Why she was chosen for the coat of arms of the town is unclear. She is, of course, in front of the town hall [small photo bellow right]. 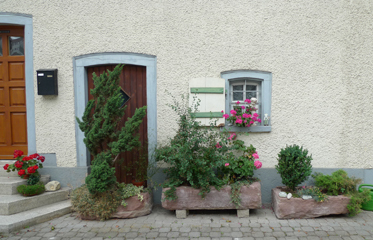 Town of Mohringen with 30 selected photos is also in our collection.